Thanks to a new integrated flattening concept developed by TRUMPF Inc., Farmington, CT, fabricators can punch a large number of holes in thin sheetmetal without distorting the panel. During a standard punching process, the punch draws material into the hole as it penetrates the sheet. This creates compressive stress. Then, as the punch withdraws, tensile stress arises. 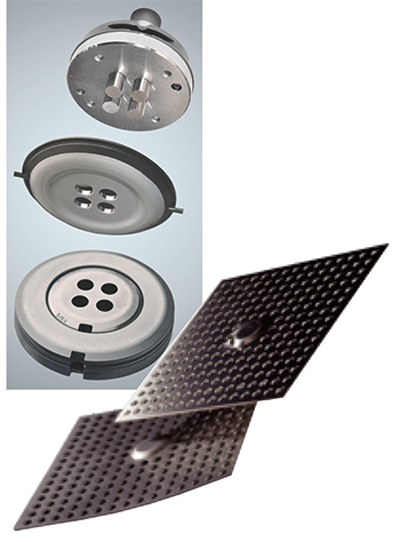 These forces can cause material deformation, especially when processing thin-gauge sheet with many holes. Now, with integrated flattening, opposing stresses are introduced to keep the sheetmetal panels flat, eliminating post-process flattening. The function is available on Trumpf’s TruPunch 5000 punching machine and TruMatic 7000 punch-laser combination machine. It works thanks to a convex die working in tandem with a concave stripper that features a recess and special coating. The convex die presses the sheetmetal against the stripper from underneath, to overbend the material. The concave stripper counteracts by pressing the material raised by the die back downward at the edge of the die. The overbending creates counter-stresses, which offset the compressive and tensile stresses caused by the punching process. The end result: the material leaves the machine flat.